James O'Neil was born in 1930 in Winnipeg, Canada, and was granted his U.S. Citizenship the same year. He enlisted in the Aviation Cadet Program of the U.S. Air Force for Aircraft Observer training on August 11, 1952, and was commissioned a 2nd Lt and awarded his basic Observer Wings at Mather AFB, California, on October 7, 1953. Lt O'Neil next completed Navigator-Bombardier training at Mather AFB, and was awarded his Navigator Wings in February 1954. After completing B-36 Peacemaker Combat Crew Training, his first assignment was as a B-36 Aircraft Observer and Navigator-Bombardier with the 336th Bomb Squadron of the 95th Bomb Wing at Biggs AFB, Texas, from April 1954 to March 1957. He was then accepted for pilot training, and was awarded his pilot wings at Greenville AFB, Mississippi, in March 1958. After completing F-84F Thunderstreak training and F-100 Super Sabre Combat Crew Training, Lt O'Neil served with the 312th Tactical Fighter Wing (TFW) at Cannon AFB, New Mexico, from September 1958 to February 1959, and then with the 522nd Tactical Fighter Squadron (TFS) of the 27th TFW at Cannon AFB from February 1959 to May 1960. During this time he deployed with his squadron to Incirlik AB, Turkey, from October 1959 to February 1960. Capt O'Neil next served as an F-100 pilot and later as an F-105 Thunderchief pilot with the 8th TFS of the 49th TFW at Spangdahlem AB, West Germany, from May 1960 to April 1962, and then on the staff of the 49th TFW from April 1962 to May 1964. His next assignment was on the staff of the 4520th Combat Crew Training Wing at Nellis AFB, Nevada, from June 1964 to May 1965, and then as an F-105 instructor pilot with the 4523rd Combat Crew Training Squadron at Nellis from May 1965 to June 1966. Maj O'Neil deployed to Southeast Asia in June 1966, and flew 101 combat missions in the F-105F between June and December 1966 with the 388th TFW at Korat Royal Thai AFB, Thailand. He then served as an F-105F Wild Weasel instructor pilot with the 4537th Fighter Weapons Squadron at Nellis AFB from January 1967 to August 1968, followed by service on the staff of the U.S. Air Force Fighter Weapons Center at Nellis from August 1968 to December 1970. Col O'Neil next served as Operations Officer for the 66th Fighter Weapons Squadron at Nellis from December 1970 to January 1972, when he deployed to Southeast Asia for a second tour. 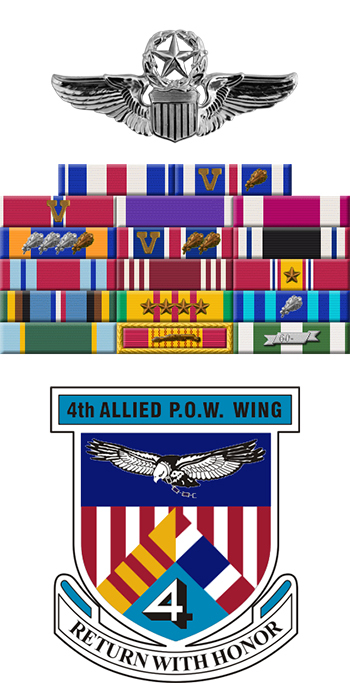 He served as an F-105G pilot and Operations Officer for the 17th Wild Weasel Squadron at Korat Royal Thai AFB from January 1972 until he was forced to eject over North Vietnam and was taken as a Prisoner of War on September 29, 1972. After spending 182 days in captivity, Col O'Neil was released during Operation Homecoming on March 29, 1973. He was briefly hospitalized to recover from his injuries at March AFB, California, and then served on the staff of Pacific Air Forces at Hickam AFB, Hawaii, from July 1973 to August 1976. Col O'Neil's final assignment was as Assistant Deputy Commander for Maintenance of the 23rd TFW at England AFB, Louisiana, from August 1976 until his retirement from the Air Force on July 1, 1980. Jim O'Neil died on June 7, 2013, and was buried at the Southern Nevada Veteran's Memorial Cemetery in Boulder City, Nevada. 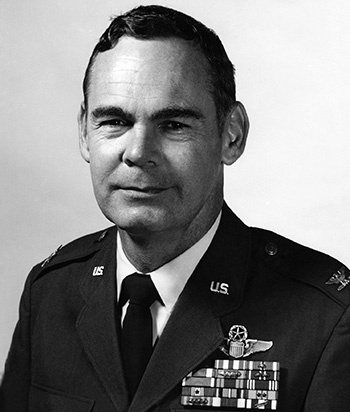 Lieutenant Colonel James W. O'Neil distinguished himself by gallantry in connection with military operations against an opposing armed force as an F-105G Pilot near Phuc Yen Airfield, North Vietnam, on 29 September 1972. On that date, while supporting air strikes against enemy storage areas, Colonel O'Neil repeatedly exposed himself to enemy antiaircraft defenses in order to draw fire away from nearby American forces. With complete disregard for his own safety, Colonel O'Neil continued to engage a surface-to-air missile site despite indications of a missile accurately tracking his aircraft. This courageous and aggressive attack enabled the strike forces to penetrate the target area defenses, successfully complete their mission, and safely withdraw. By his gallantry and devotion to duty, Colonel O'Neil has reflected great credit upon himself and the United States Air Force.